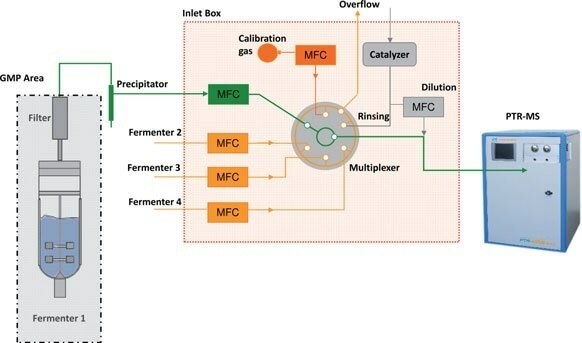 The monitoring of biotechnological fermentation processes, used for the production of modern biopharmaceutical drugs, is becoming ever more relevant for the promotion of economical production, particularly within the manufacturing sector. Up until now, biotechnical techniques have typically been monitored through off-line analysis, which is laborious, costly and frequently delivers results too late to allow for corrective actions. Strongly relevant process data can now be offered, both online and in real-time, through IONICON PTR-MS. These systems can monitor a broad spectrum of volatile metabolites in the off-gas of fermenters. As these measured concentrations are in correlation with microorganism activity, they can be utilized for online quality assurance. Techniques such as these meet with the recommendations of the Process Analytical Technology (PAT) initiative put forward by the US Food and Drugs Administration (FDA) to offer greater safety, efficiency and quality in drug production methods. Testing of the non-invasive application has been carried out in industrial, Good Manufacturing Practice (GMP) controlled settings. Within bioreactors, volatile organic compounds (VOCs) are released as metabolic by-products of microbial growth and production. With the help of PTR-MS, it is possible to monitor these volatile metabolites in the off-gas of a bioreactor in real time, enabling researchers to gage the activity of microorganisms for quality assurance and process control. 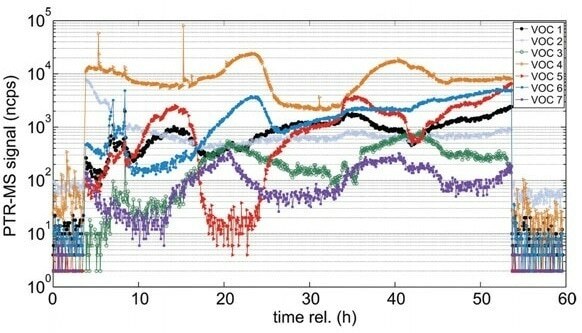 Up to 70 VOCs with significant concentrations and distinct variations over time have been identified in E. coli fermentations. Notable examples can be seen in Figure 1. Figure 1. Typical signals for bioprocess monitoring with PTR-MS. Seven out of 70 volatile metabolites (VOCs) exemplify the distinct variations observed over the course of a fermentation (from Singer et al. Am. Lab. 2011). A rapid, quantitative transfer of the sample to the PTR-MS is of great importance in this situation. IONICON has created an optimized coupling system for biotech applications which offers dilution of the sample gas, safety processes, multiplexing and automatic calibration for quality assurance. The system is shown in Figure 2. Figure 2. PTR-MS setup for bioprocess monitoring, including multiplexing, dilution and calibration; now integrated into IONICON's PTR-MS bio system (from Luchner et al., EBR 2014). This entire system, made up of an IONICON PTR-MS and the specially designed coupling system, has been shown to be highly durable, and has been in operation at various industrial test sites for a number of years. This structure has now been assimilated into IONICON’s PTR-MS bio system, delivering a cohesive PTR-MS solution, developed with the biotech industry in mind. As shown by Luchner et al., an understanding of the underlying microbial metabolism enables researchers to relate observed signals directly to metabolic activity. It is possible to identify a metabolic overload of cells through changes in particular signals, as seen in Figure 3. This offers encouraging perspectives for advanced process control. Figure 3. 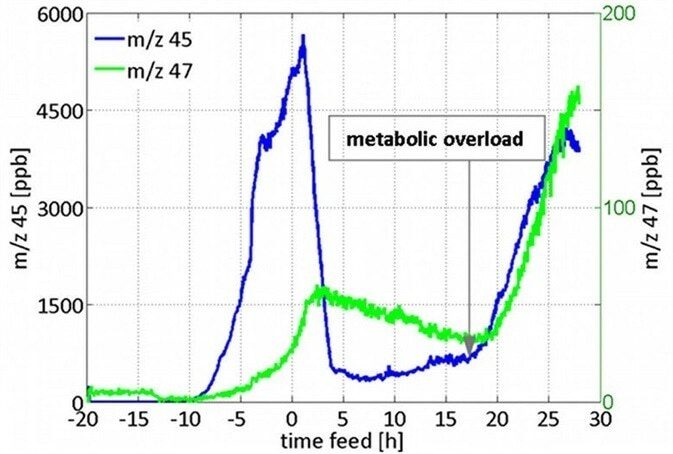 Signal for acetaldehyde (m/z 45) and ethanol (m/z 47) from a recombinant E. coli fed-batch cultivation, giving information on metabolic overload (from Luchner et al., Biotechnol Bioeng. 2012). Following successful testing in recent fermentations, a further significant step has been made by the IONICON Proton Transfer Reaction - Mass Spectrometry technology with its use for real-time process monitoring in an industrial, GMP (Good Manufacturing Practice) controlled fermentation process. The capacity to monitor volatile microbial metabolites in the off-gas, without the need for amendments to the current process, has allowed PTR-MS to be introduced to this tightly-regulated field. IONICON Analytik was founded 1998 as a spin-off company of the University of Innsbruck, Austria commercializing an innovative technology called Proton Transfer Reaction - Mass Spectrometry. Since then they have been improving this leading-edge technology resulting in the development of several types of ultra sensitive high resolution online mass spectrometers for monitoring and quantification of volatile organic compounds (VOCs) in sub-pptv level concentrations. Today they are the world’s leading producer of trace gas analyzers with market-leading, real-time, single-digit pptv-level detection limits using the unique Proton Transfer Reaction – Mass Spectrometry (PTR-MS) and Selective Reagent Ionization – Mass Spectrometry (SRI-MS) technology. Their product portfolio includes quadrupole MS and time of flight MS based instruments, industrial VOC monitoring solutions and custom built instrumentation, complemented by their own range of trace calibration devices and accessories. Since 1998, they are serving their customers in many different application areas including atmospheric chemistry, environmental research and trace gas analysis (e.g. emissions in urban and remote areas, indoor spaces, vehicles), food and flavor science (e.g. analysis of coffee, olive oil, butter, cheese, wine, herbal extracts and aromas), industrial VOC monitoring (e.g. in waste incineration plants, chemical factories and production sites of the semiconductor industry) and illicit substances detection (Explosives, CWAs, TICs). A special focus was given to medical and biotechnological applications where real-time monitoring of industrial fermentation processes, of synthetic gas production processes in the petrochemical industry and real-time breath gas analysis in clinical settings are carried out. They also offer analytical services and are an active contributor to numerous international scientific research and training projects. In 2016 they proudly celebrated 300 PTR-MS instruments sold. They manufacture their precision instruments at their company site located in Innsbruck, Austria.